Showcasing one of the greatest contemporary voices of our time, Linda Eder’s diverse repertoire spans Broadway, standards, pop, country and jazz. I first interviewed Linda back in 2010 at Feinstein's in NYC (click here for that interview) when she was promoting her album "Soundtrack." 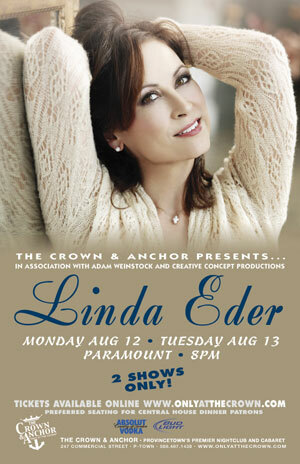 Now, three years later, it's an honor to catch up with Linda in Provincetown, MA as she brings her incomparable voice to The Crown & Anchor's Paramount (247 Commercial Street) for two nights only, Monday, August 12 and Tuesday, August 13 at 8pm. For more on Linda be sure to visit http://www.lindaeder.com and follow her on Facebook, Twitter, and YouTube! 1. We first met in 2010 when you were performing at Feinstein's, in support of your album "Soundtrack." Since that time you released "Now" & continued to tour around the world. On "Now," you collaborated with Frank Wildhorn once again. What do you like most about working together & singing his music? What do you connect to most with his music? Frank writes really pretty melodies with nice intervals that are fun to sing and seem to work really well with my voice and my style of singing. When he teams with a great lyricist like Jack Murphy or Nan Nighton it is pretty magical. 2. You are back out on tour again. One stop on your current tour is Provincetown, MA. What do you enjoy most about performing here? The audience is made up of mostly gay men and so it is always a wild fun night with lots of wonderful feedback from the crowd and that is what performers live for. 3. You will be performing at The Crown & Anchor on August 12 & 13. What do you feel this venue offers your show that another one might not? Location, location, location! Isn’t that what they always say? It’s on the water; it’s a small intimate room, always a great crowd. 4. What do you hope audiences come away with after seeing your show? I hope they had fun. I hope they laughed. Most of all I hope they are moved emotionally. 5. What is your favorite part about putting a show together? Putting shows together is work. It takes some thought to how the songs will flow so I have to sit quietly and concentrate. That’s why I usually procrastinate but I also know that I have a knack for putting set list together. 6. What is your favorite part about putting an album together? On a new CD my favorite part is singing the background vocals. It sounds funny but I love to harmonize. It’s also always so great to hear the new arrangements played down for the first time. 7. What singers inspire you today? So many it’s really hard to name them all. I listen to singers for different reasons. Some have incredible, gymnastic voices that I like to listen to for that reason but when it comes to enjoying music for the sake of music it isn’t always the singer with the biggest range of greatest vocal licks. It always comes down to the song. So these days I listen more for the songs and the mood or emotion it creates in me. 8. Aside from singing, are there other aspects of entertainment you want to pursue? Any aspirations to come back to Broadway? I would like to get into acting a little bit. Maybe some TV. As for Broadway, I don’t have plans at the moment but I would actually like to do a play. I don’t know that I want to sing 8 shows a week anymore. 10. If you could have any super power, which one would you choose? The power of flight! Absolutely! As the tragic character "Lucy" in the Broadway musical Jekyll & Hyde, from composer Frank Wildhorn, Linda blew the roof off of New York’s Plymouth Theatre each night as she belted out signature songs "Someone Like You" and "A New Life." Her Broadway debut, for which she was rewarded with a Drama Desk nomination, sent her already rapidly rising star blazing across the sky, securing her spot as one of America’s most beloved singers and dynamic live performers. Most recently, Linda crowned her two-decade recording career with a new album, Now, which reunited Linda with Broadway and pop composer Frank Wildhorn. The new release marked the musical return of this legendary team after six years. Linda’s transcendent voice is the perfect complement to Wildhorn’s lush, imaginative music. Now’s 12 dynamic new tracks elevate the spirit while capturing many moods. Born in Tucson, Arizona, and raised in Brainerd, Minnesota, Linda began her career singing in her home state and eventually landed a gig at Harrah’s Casino in Atlantic City. But it was her appearances on the 1987 season of Star Search, where she won for an unprecedented 12 weeks, that attracted the attention of audiences and record companies alike. Linda launched her recording career in 1991 with her self-titled debut album and soon established a vital niche as America’s most popular and acclaimed new interpreter of pop standards and theatrical songs with 14 solo albums and 12 musical recordings. Those albums highlight Linda’s abundant vocal gifts as well as her skill for delivering dramatic, emotionally resonant interpretations of familiar songs while making them her own. She followed up with The Other Side of Me, a country pop blend of contemporary music – including a song written by Linda. In Fall 2010, Linda released Soundtrack. Produced by Peter Collins, Soundtrack finds Linda going to the movies and adding new dimensions to an eclectic mix of themes from the silver screen. The 12 tracks span the last 50 years in cinema, from Henry Mancini’s "Charade," the title tune of the 1963 movie starring Cary Grant and Audrey Hepburn, to "Falling Slowly," the Best Original Song Academy Award winner from the movie Once. In June 2010, Linda and Clay Aiken covered Roy Orbison’s "Crying" as a duet on Clay’s album Tried & True. She was recently featured on two PBS television specials including Clay Aiken’s Tried & True and Hallelujah Broadway. The concert stage remains the mainstay of Linda’s career. She has performed for sold-out crowds and venues across the country and throughout Europe. Her concerts have been televised on Bravo and PBS. Trail Mix, her primetime Animal Planet special, was a natural extension of her love of animals for this Minnesota native who remains a "farm girl" at heart. Linda has performed at many prestigious venues such as Carnegie Hall, The Town Hall, The Kennedy Center, Davies Hall, Radio City Music Hall, Wolftrap and the Ravinia Festival. Always touring in good company, her collaborations include the late Oscar-winning composer and pianist Marvin Hamlisch, Tony-winner Michael Feinstein and Keith Lockhart, conductor of the Boston Pops Orchestra.